Sign up at janice@wildsouth.org or 256-974-6166. Group size is limited and advance sign-up is required. Distance: 1 mile roundtrip to Kinlock Shelter, then .5 mile or less roundtrip on Hubbard Creek (Kinlock Falls). Level of challenge: Moderate. The most challenging part of this hike is the very brief, steep rocky descent into the canyon. This 2-part outing will begin on Kinlock Road on the far western edge of the Sipsey Wilderness in the Kinlock Historic District, which was determined eligible for the National Register of Historic Places in 2000 because of its enormously significant Native American, pioneer and Civil War history. 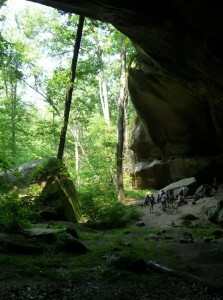 Kinlock Shelter is a huge rock shelter that is a sacred site for Native Americans. Habitation dates from 8,000 to 10,000 years ago. After the shelter, we will drive a mile back down to Hubbard Creek, which we will have crossed on the way up, have lunch and explore this beautiful, deep-shaded stream and Kinlock Falls. Be prepared for rough trail, slippery rocks, summer heat, ticks, stinging insects. Footwear must be sturdy and protective with reliable tread for slick rocks and creekbeds (for those who want to wade in the creek! ).